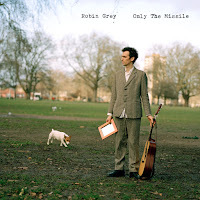 I know I raved about The Notes And Scratches, both in my last podcast and the blog, but another really great artist from podcast #2 is Robin Grey. Grey is a British singer/songwriter who released his debut album, Only The Missile, in 2008. He's really talented and has a nice folk sound. I played a track off of Only The Missile and I Love Leonard Cohen on podcast #2 - that's just two tracks. If I wanted to I probably could have played the entire Missile album straight through, but then I'd be running late because I'd want to play The Notes and Scratches too. I think the reason I like his music is because it's thoughtful, and not too light that it gets on your nerves. I said in episode #1 that I disliked the majority of Ben's Imaginary Band's Nocturnal Fables album, primarily because it was too light. This isn't the case for Robin Grey, although I think I may be biased by some of the country roots intertwined with the folk sound. Though this isn't a main reason why I really like the music, I do find it neat/interesting that he throws in a lot of religious imagery into his music - and not just the obvious stuff, but things you don't hear too often like the old story about the fool who built his house on the sand. You can definitely expect to hear more of Robin Grey on the podcast - but you can download his music for free right now from Jamendo.